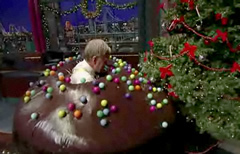 Last night on The Late Show With David Letterman, Letterman got a chance to test-drive a $25,000 four-foot by four-foot chocolate cupcake car. "If you buy it, it comes with a helmet that reads [bleep]." Once he got the hang of it, he went on a destructive rampage, using the cupcake car to repeatedly slam into a Christmas tree. what does it say on the helmet?